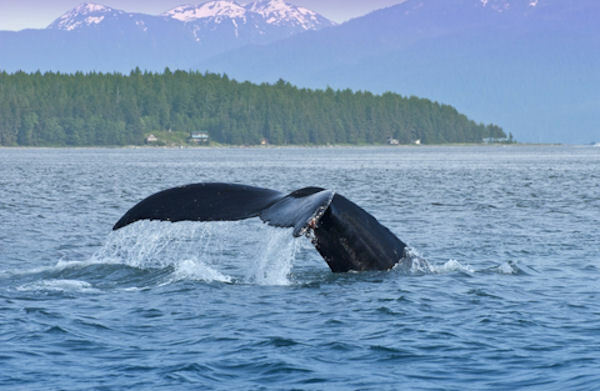 Board your comfortable vessel and set out on a search for humpback whales, Orcas, porpoises, sea lions, eagles and other wildlife. A naturalist will explain wildlife behavior and point out the sights for you. Venture out on deck for a close view and amazing photo opportunities. Whale sightings are guaranteed or you receive a refund of 0 for your whale watching portion! At the Gold Creek Salmon Bake, in a beautiful setting nestled in the rain forest, you’ll arrive to the smell of wild Alaskan salmon grilling over an open alder wood fire. The all-you-can-eat buffet also includes Cheechako Chicken, Gold Rush Potatoes, Chilkoot Baked Beans, Tongass Wild-Rice Pilaf, salads and other sides, beverages, and blueberry cake for dessert! After dinner, roast marshmallows over a crackling campfire, visit the Salmon Creek Trading Post, and stroll to the beautiful Salmon Creek waterfall. Don't forget your camera. Sequence of tour features may vary. Suitable for all ages. Children 12 and under must be accompanied by an adult. Children ages 13-17 must have a signed parental consent form if traveling without a parent or guardian. Child's rates if applicable are for children age 3 to 12. Under 2 is no charge. Some final notes: bring your vouchers and dress comfortably for the weather (if your tour is on the water it will be about 10 degrees cooler). Camera and binoculars are suggested for land-based tours. This tour is not suitable for wheelchair and/or scooter guests due to the uneven terrain at the salmon bake.